Did you know they have cows at SeaWorld? For those of you who doubt that my theory about daily cow sightings is true, and for those who haven’t read my post on why “every day I see a cow“, I have the ultimate proof for you. At no other place than SeaWorld San Diego, where you go to discover and marvel about the wonders of the ocean, you’ll see a cow. Don’t believe me? I had to take a picture of it as a proof, so here it is! 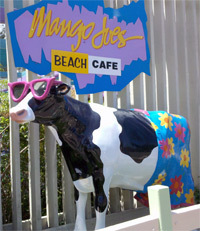 You’ll find the lovely sun-baskin’ bovine at the entrance of the Mango Joe’s Beach Cafe. I’d like to add that during this morning’s visit, we also witnessed amazing behavior from a group of killer whales (orcas), consisting of one adult and two younger whales. They were kissing, yes, KISSING! Take a look at this photo for a close-up of what we got lucky enough to observe. 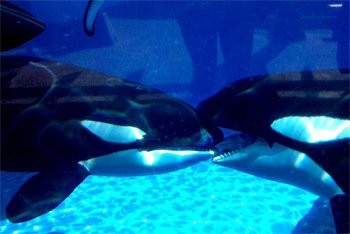 The youngsters would kiss each other, then move on to the adult female and kiss her too. This went on for the 10 minutes we stood there and it generated quite a lot of photos from passers-by like us. So if you read anywhere else on the web that someone saw orcas kissing, you’ll know that’s true, just like the fact that you do get to see a cow every day. This entry was posted in Animals, Child Raising, Children, Cows, Entertainment, Kids, Parenting, San Diego and tagged animals, child raising, Children, cows, entertainment, kids, killer whales, orcas, Parenting, real California milk, San Diego, Seaworld. Bookmark the permalink.